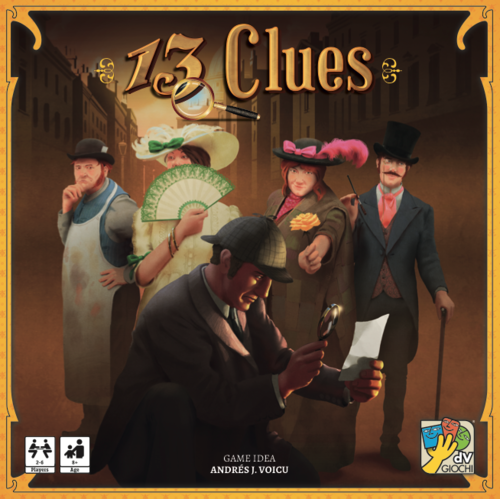 13 Clues is set in Victorian London, and each player is an investigator for Scotland Yard. In this deduction game, you will be able to see the clues for the other players (person / location / weapon) but you cannot see your own. Your goal is to figure out your own case before the other players can figure out their own! 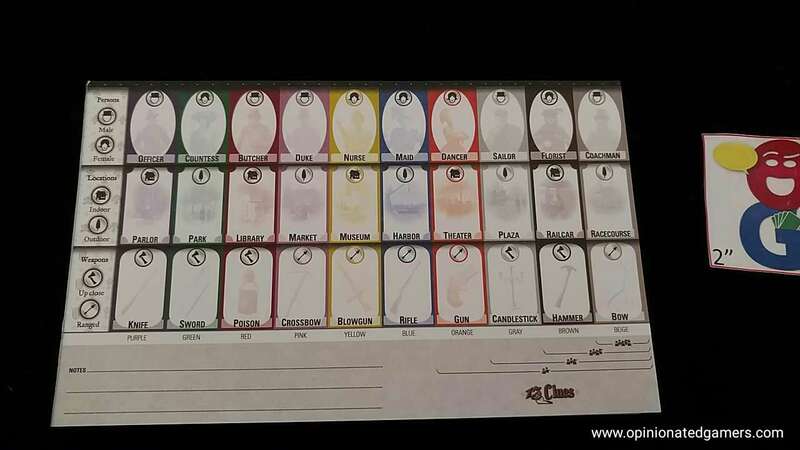 There is a deck of 30 cards, split up into ten colored sets of person/location/weapon. The people can be male or female. Locations can be inside or outside. Weapons can be ranged or melee. Based on the number of players, some of the colored sets are removed from the game. Then, the cards are first split up by category and shuffled. Each player is dealt one random person, location and weapon card. Then, the remaining deck is combined, shuffled, and each player is dealt two cards at random from the deck. Any leftover cards are placed face down on the secret informant board in the center of the table. Each player now gets a card holder, and he chooses three cards, one from each category to place on that holder. When all players have chosen, everyone now places their filled card rack in front of the player to their left – in a way so that the player to left is unable to see any of the cards in front of them. The two remaining cards from your original hand are then kept behind your screen where only you can see them. 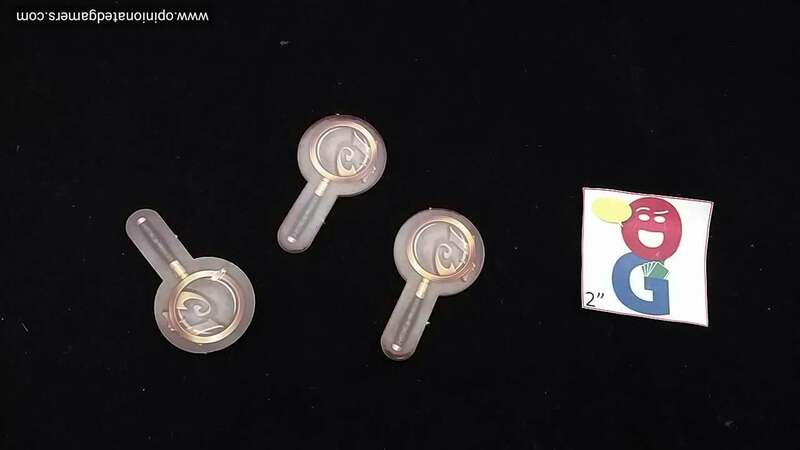 1) Question a Witness – give you Magnifying glass to any other player and ask them how many cards they see of a suit (color), category (person/location/weapon) or a subcategory (men/ women/ inside/ outside/ ranged weapon/ melee weapon). The answer must be truthful and includes all the cards they see – that is all the cards in front of all other players AND the two cards behind their screen. 2) Consult the Secret Informant – Give your Magnifying glass to the player with the fewest Magnifying glasses and then choose one of the face down cards on the Secret Informant board, secretly look at it, and then place it back in the same place. 3) Make an Accusation – Give your Magnifying glass to the player with the fewest Magnifying glasses and then try to solve your mystery (cards in front of you). Simply state the three cards you think are in front of you. If you are correct, you win the game. If you are incorrect, any player simply tells you that your accusation is wrong. You do not lose the game nor suffer any other punishment, however that particular action is complete. If you still have Magnifying glasses, you may make another accusation or take one of the other actions. When you are out of Magnifying glasses, your turn is over, and the next player clockwise now gets a chance to use up all of his Magnifying glasses in the same way. The game is immediately won when a player makes a correct accusation. I really like deduction games, and the Achilles heel of every single one of them is that they rely upon 100% truthful and correct answers from all participants at all times. A single mis-step can throw off the entire game. Of course, the game length here is 20-30 minutes, so that’s not a huge deal, but I cannot tell you how frustrated I’ve been when a 90+ minute game of Black Vienna proves to be worthless because someone screwed up an answer at some point in the past! The title of the game stems from the fact that there will be 13 pieces of information unknown to you at the start of the game, and you goal is to figure out which 3 things are in front of your screen. The board in the center of the table holds the extra cards which weren’t dealt to anyone – and in our games, people have pretty much gone for those first – because you might as well know all the things you can before you ask questions. It really doesn’t make any sense to try to learn things from queries until you know what the facedown cards are in the middle of the table. The trick to the game is figuring out which questions to ask (and to which player) in order to glean information about the cards on the table. 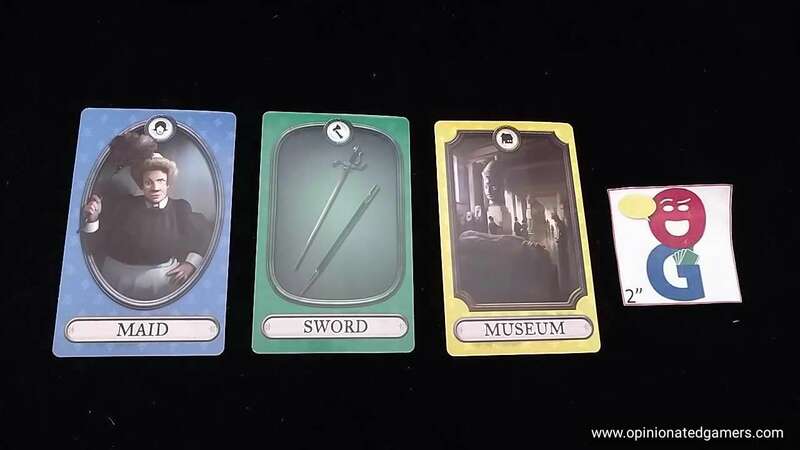 As you hear the responses from the other players, you need to figure out whether the cards seen are behind someone’s screen or if they are in front of your own screen. Oftentimes, you will learn the most information when the same question (or similar question) is asked a second time. I think that there might be a second level of the game where you might ask questions about information you already know in order to throw people off about what you are concealing – but I’m not smart enough for that – and our games seem to end quick enough that I didn’t really feel like I had an extra turn to use just to try to mislead other people as opposed to learning information for yourself. I still don’t have a great system to record the information in the game, and I’m not sure that the provided answer sheet is the best format for me. I’d really like there to be more space for information recording – which would mean smaller illustrations. As it is, I just write out notes in longhand on the back of the sheet. I have found that it’s important to me to record who asked which questions and the possible answers – as it’s in the comparison of answers of similar questions that often leads to important inferences. Games are usually quick, though there are always a few moments in the game when players have to spend a minute or two looking at their sheets to try to figure out what question to ask. The magnifying glasses tend to spread themselves evenly around the table, and it’s rare for someone to be out of them when their turn starts. Overall, 13 Clues provides a solid (and short) deduction game. In our first few plays, the games have felt a little bit like a race as people seem to be gaining information at about the same rate. As I get more experience with it, I would like to try to explore the possibilities of misleading questions and accusations. Andrea “Liga” Ligabue (3 plays): I’m always looking with interest in deduction games and I’m always against too much randomness. 13 clues has no randomness at all: it is a real deduction race. The match are always tight and usually winning/losing is a matter of clever deduction. I’m not really sure about the longevity but after 3 games I still waiting to play it more and more. Nathan Beeler: Deduction games in their purest form aren’t really my thing. For me they all suffer the same problem to some degree or another, which is that I want time to sit with each new piece of information and subtlety, but I can’t really have that and also have good game flow. If I loved the form I’d probably be more into the play by email/turn based versions which do allow for that necessary space. Sitting over a board just never works, and this fine entry is no exception. I suppose if there were a game that had a deduction element that was part of a larger whole, that could be really intriguing. Does this exist? Karen Miller: I am not a big fan of deduction games. I find them stressful to play because I am sure I will be the one to give incorrect information and ruin the entire game. That being said, this game is pretty straightforward and it is relatively easy to give the correct answers to the questions being asked. I am generally terrible at deduction games. Good thing I didn’t fulfill my early desire of becoming a police detective! Like Dale mentions, I can never figure out the best way to record information, making so many notes that I just cannot seem to piece them together to deduce a foolproof conclusion. I have the same problem here, but somehow managed to win my first game. My biggest problem with the game is that it can be lightning fast. I played one game wherein I only had one turn as an astute player correctly identified his three cards on his second turn. The game needs to last a bit longer to build the tension and give everyone a reasonable chance at identifying their cards. Nate: the only one that comes to mind offhand is Alchemists, but there are probably others. 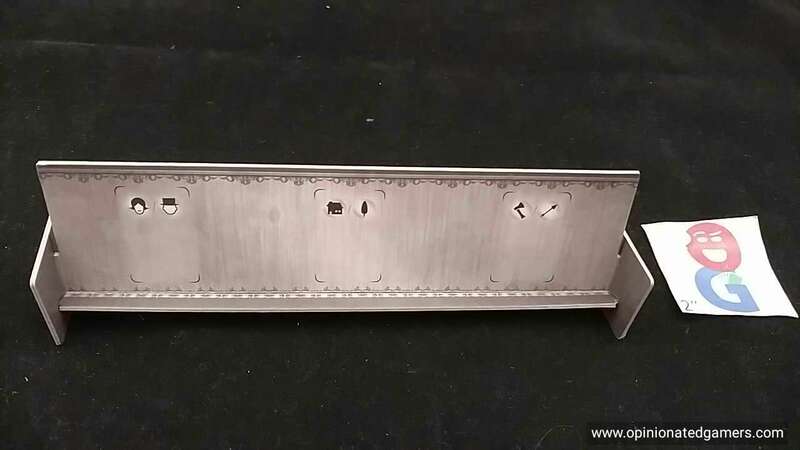 Hi, nice post! But there is one thing, when you said: “You do not lose the game nor suffer any other punishment, however that particular action is complete. If you still have Magnifying glasses, you may make another accusation or take one of the other actions.” this is inaccurate. In the acusation part of the manual says: “If you’re wrong, they just tell you! YOUR TURN IS OVER: discard ANY Magnifying Glasses you have left to the general supply”. So it’s not the particular action is over, it’s the whole turn, sou you can’t investigate further if you make an accusation on that turn. Maybe you just meant turn instead of action?